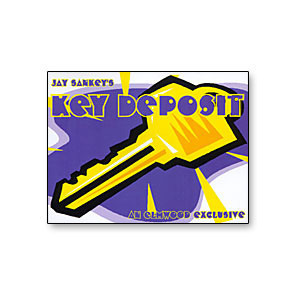 Today, when you order "Key Deposit trick by Jay Sankey", you'll instantly be emailed a Penguin Magic gift certificate. You can spend it on anything you like at Penguin, just like cash. Just complete your order as normal, and within seconds you'll get an email with your gift certificate. The magician brings out his key chain, removes a single key and places it into a spectator's hand. He then removes the metal key tag from the chain and points out the hole running through it. He places the tag into the spectator's other hand and explains he's going to make "nothing" move from one location to another. The spectator taps her fists together and when she opens the hand with the key tag, the hole is now gone! Stranger still, when she opens her other hand she discovers that "nothing" really has moved-the key she's been holding the entire time now has two holes in it! The beauty of this trick is that as I sit here and play with it I begin to notice how well the pieces work together to justify actions, to camouflage things you don't want the spectators to see, and to beautify the effect "Holy Moly" that has moments of you simply standing there hiding the dirt while pattering away (and looking like a suspicious fool). This take on that effect allows you to put the materials on the table while you speak, handle things "naturally," and END COMPLETELY clean with a justified action that is not suspicious AT ALL. You could also present this the same way as "Holy Moly" with a special move or two, but I'm keeping this one simple. Those who are familiar with Jay Sankey know one thing, he is extremely talented and can make the hardest things look easy. This reflects sometimes into his marketed items. You buy it and never perform it because of a particular move that is too hard to confidently pull off. This trick is not one of those. There is a common slight needed for 'Key Deposit'as it's not self-working, but it is one of the more easy slights, plus if you don't know it you need to learn it anyway. You'll have it down in no time (though practice does make perfect). There are no gimmicks parse, there is an extra but nothing has any secret moving parts and you end clean. The motions during the routine are comfortable, natural looking, and logical. The secret move happens at a perfect time. I love this purchase and highly recommend it. If Jay had come out with this many moons ago, before his repertoire grew so massive, this trick would probably be going down in the annals as one of his best. I love magic with ordinary easy to understand objects. This fits the bill. The the person who says the tags do not look very good, I disagree and honestly if you don't use this because of that then all you have to do is go to the store and buy new tags for a couple of bucks...maybe? No need to, this trick is simple and great. Typical Jay Sankey magic, you end totally clean, the slights (very very simple a beginner can master in five minutes if they don't know how) are easy and really not even slights. 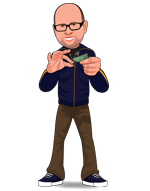 Keep this on your key chain along with Killer Key by Sankey and have Ring Flight or something else on your ring and you've got a whole bunch of magic in your pocket for a little bit of nothing. I bought this about ten months ago, never opened it, now I have it with me all the time when I need something. Just get it, nice trick and easy explanation, you can do it after five or ten minutes tops. As the title says, I like it, but I don't do it. The idea is neat, but the gimmicks aren't that great. If you have this in your keychain, they will get dirty and beat up prettt fast making it look different from the final give out. The tag doesn't look like a tag, this could be so much better. I was skeptical this trick would wow spectators since it is so simple and not among the latest and greatest. Wow was I wrong. It gets great reactions for me and I keep it right on my car keychain. I've sent 5X as much as on tricks that get 1/10 this reaction. Its a surprising winner.